This past weekend we went camping at Pinnacles National Monument. A national monument is like a National park only it's been established by a president rather than a congress. 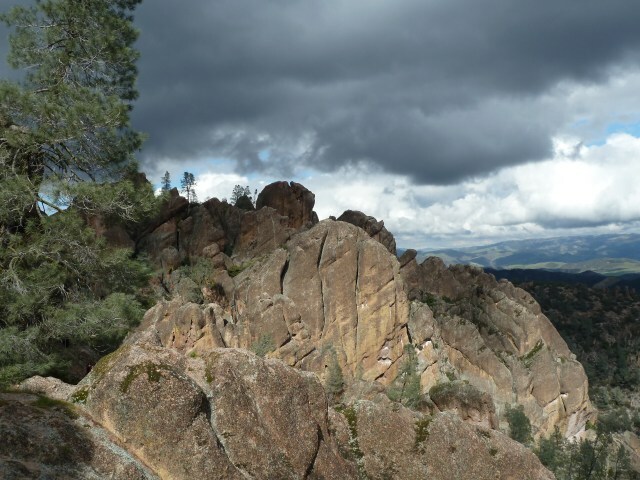 Pinnacles was established by Teddy Roosevelt who was a president. As you can see from the photo above, Pinnacles is a rugged place. 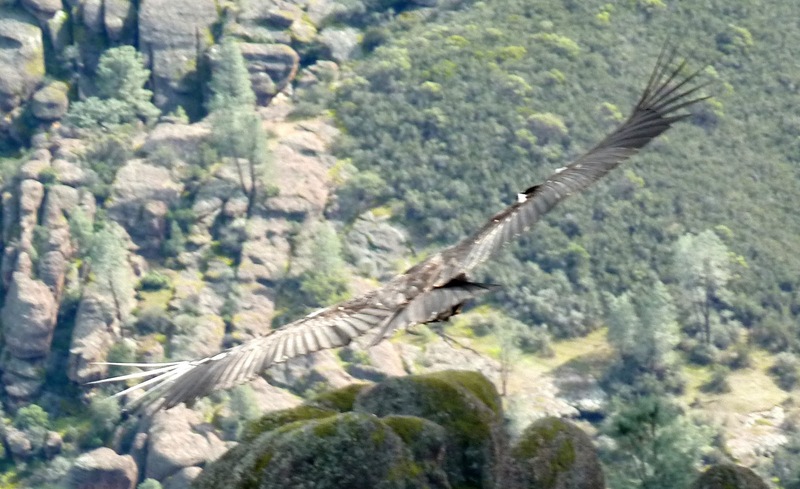 It features along with exposed rock, some of the few remaining specimens of the California Condor. At one time, the condor tribe was down to 20 some individuals. Now it is up to about 300 individuals. 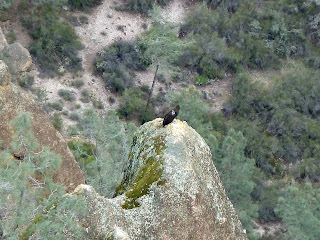 When we went to the Pinnacles, a place we had never been to before, we hoped to see some condors but figured that we would have to be extremely lucky to do so. Well, we got lucky, or maybe you don't have to be all that lucky because condors love the Pinnacles. Condors don't like to flap their wings or otherwise exert themselves. They prefer to land in a spot from which they can launch into space and then just steer for an updraft which will elevate them to a height from which they can see something large and dead. On our third day at the Pinnacles we did the hike up to the top of the Pinnacles a place from which we might be able to spot some condors according to the rangers. Up we went, and there sitting on a rock was a large bird the looked like it might be a condor. 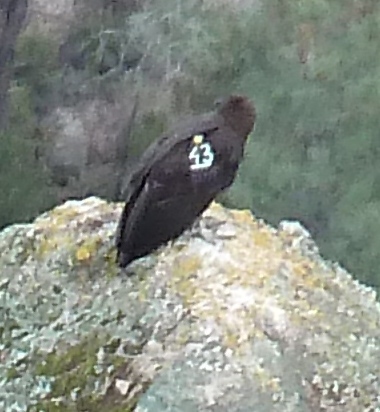 I took some pictures, put the camera in playback mode and zoomed in and sure enough, this bird had a number on it, a sure sign that it was a condor. This is a picture of the condor in flight. You can see the wing patches - white on the black feathers. This is still number 43. Now I need to point out that there are also a lot of turkey vultures around and at a distance, condors are hard to tell from the vultures. 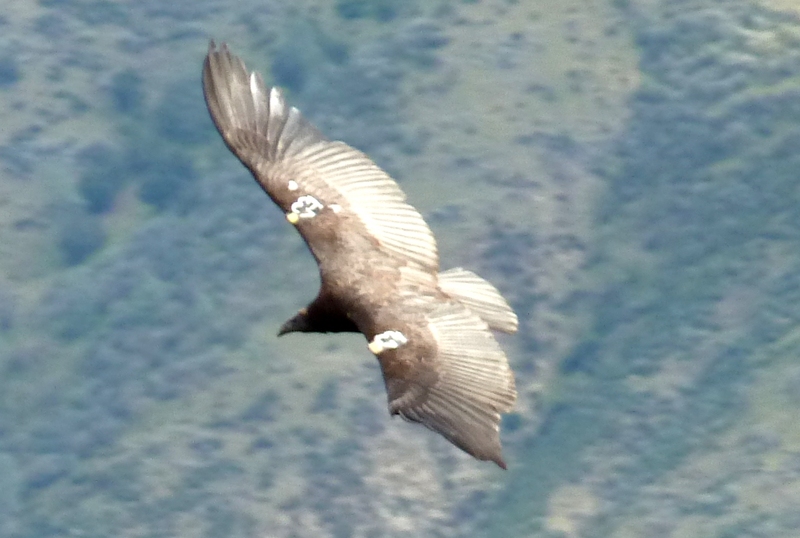 Once you've seen a condor, you can tell it from a vulture. And if nothing else, if you've got good binoculars, you can tell them apart because condors have numbers on them. Imagine you have to teach an alien how to tell football players from ordinary humans. Probably the easiest way is to tell the alien that football players have numbers on them. One last photo. Condors have 9 foot wing spans. I just went to the library and checked out a book on Condors. It was written at a point when the Condor population was down to twenty some birds. I hope to find out more about what their chances are for survival on their own. Keeping them alive right now is a multi million dollar effort. A lot of that money comes from private donations. And I hope the people who are working on this project are successful and get to put themselves out of a job.